Spring is on its way, warm weather is here, and we're eating colorful food to celebrate! We've been spoiled with beautiful warm weather all week in North Carolina, and I think it's putting everybody in a good mood. It's hard to be angry about anything when you walk outside to sunny 70 degree weather with a slight breeze. Also, complaining is detrimental to our health, so let's find something to be grateful for. Having access to healthy, delicious food is something I never want to take for granted. I know food bloggers tend to exaggerate about recipes, but I'm not exaggerating when I say that this wheat berry salad is the best thing to come out of my kitchen in a long time. I had never cooked with wheat berries before, but now I'm totally hooked. They're deliciously nutty and chewy, a bit like farro, but with more flavor, and they hold up beautifully in salads. If like me, you didn't know what a wheat berry is, it's the whole grain or seed that is milled down into flour. 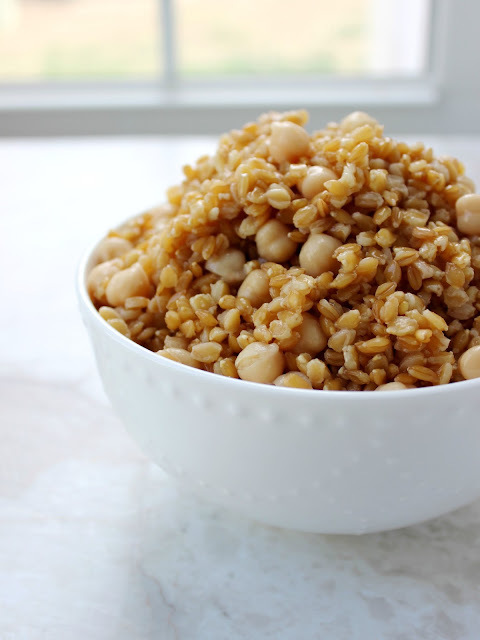 For this recipe, I used Jovial 100% Einkorn wheat berries. Einkorn is an ancient variety of wheat that has more vitamins and minerals than modern, processed wheat. I made pizza crust with Einkorn wheat a couple weeks ago, and I plan to incorporate more Einkorn products into our diet. 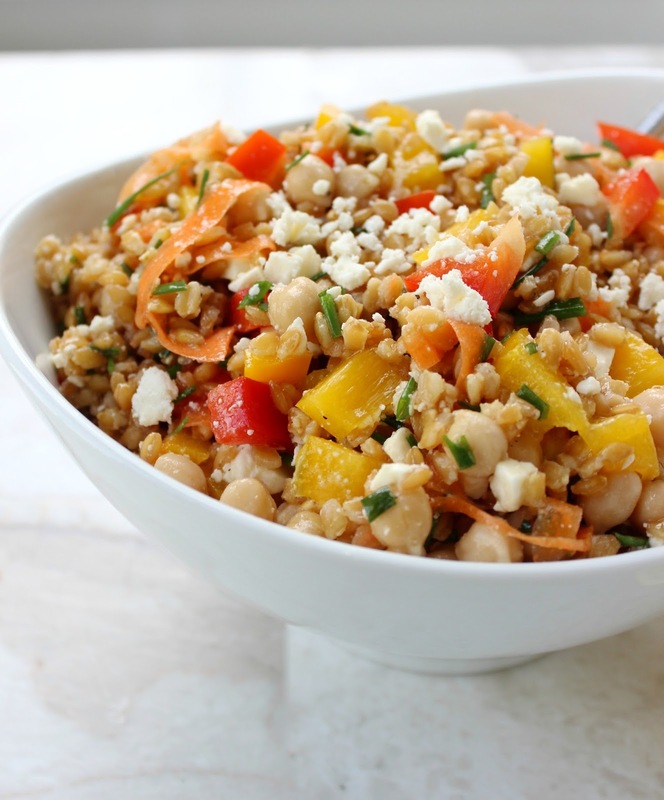 This wheat berry salad would be great to take for lunch (!) or a barbecue (!!) or a spring picnic (!!!). Can you tell I'm excited for spring? Cook the wheat berries according to package directions and set aside to cool. In a small bowl, whisk together all the dressing ingredients and set aside. 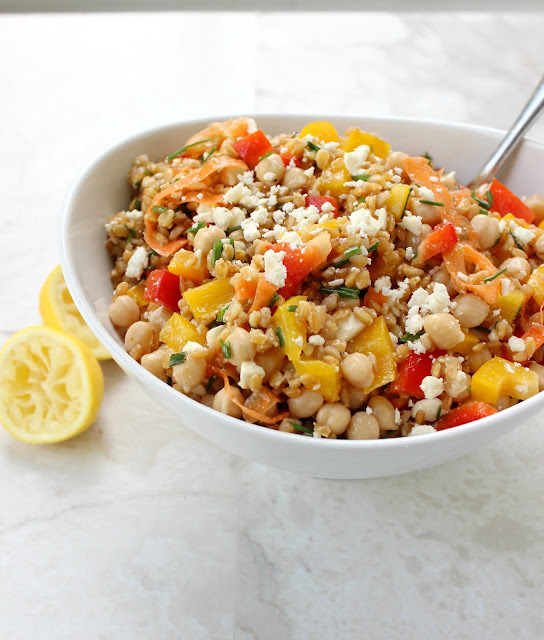 In a large bowl, combine wheat berries, chickpeas, chopped peppers, carrot ribbons, chives, and feta cheese. Pour dressing over salad and stir to evenly coat all the ingredients. Taste and add additional salt or pepper as needed. The salad can be eaten immediately or stored in the fridge for several hours. If you don't have wheat berries, you can easily substitute with farro, quinoa, or brown rice. This salad gets better with time and can be stored in the fridge for up to 5 days. **I received these wheat berries from Jovial free of charge, but the opinions are all my own. Adapted from Cookie and Kate. 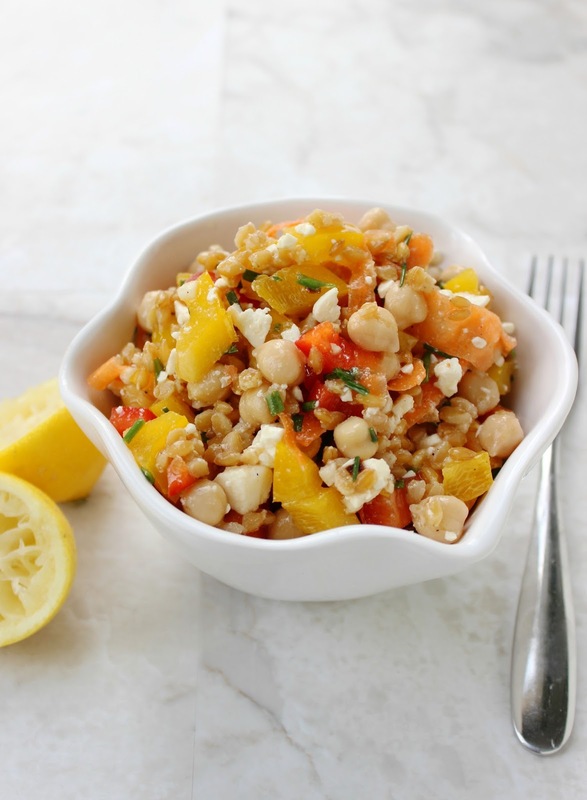 This salad looks so bright and cheery! We've had a pretty mild winter in Buffalo this year, but I'm still really ready for spring. This sounds delicious, what a nice idea. Would be great to make a batch and take some to work with me! It has been just so gorgeous here lately!! I took a walk outside today and it was awesome. I love farro and seem to always forget about wheat berries! I've only used them once! 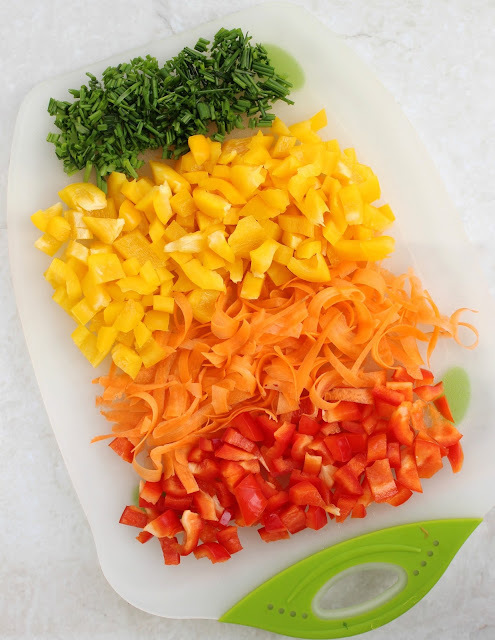 But this salad is definitely reason to use them again - I just love all the colors and flavors! I am obsessed with a similar salad that my local deli sells, they add nuts, kale and all types of veggies and I have been meaning to replicate something similar in my kitchen, definitely glad to come across this recipe, Trisha!